When parents visit a Montessori classroom and observe the children in action, one of the key things they frequently mention is how helpful and kind the children are with one another. The children interact with one another in a kind and respectful manner. How does this happen? We treat the children with respect and kindness. We discuss how to talk to one another and how to treat other people. Start with some easy basics now, and introduce more complex things as your child gets older. 1. Is someone at home sick? Involve your child in caring for this person. For example, "Mommy is in bed because she doesn't feel well. Let's be very quiet and prepare some tea for her." When the tea is ready, you can say, "Would you like to carry her napkin?" And the two of you go up to Mommy's room. 2. Ask your child to help you and thank him or her for it. For example, "This chair is heavy. Would you please help me carry it?" And, afterwards, "Thank you so much. It was nice of you to help me." 3. Discuss the fact that someone has to wake up early, so we need to be quiet at a certain time in the evening. Point to the clock and explain. 4. Ask your child if he or she would mind helping you fold the sheet for your bed (this starts a relationship in which you both help each other, so that the help does not all go one way). The two of you then have fun folding the sheet. 5. When guests arrive, let your child carry a small tray (when he or she has worked with this exercise successfully many times) to serve a snack. A great video! The father is looking at his child, smiling encouragingly, making eye contact, and making up rhymes about what he and his son are singing (plus he uses his son's name in the rhymes). A super example of a non-traditional father and toddler interaction that works out wonderfully. Love this video and the message! This nifty secure baby pad is called a topponcino, and it is a Montessori staple for infants after they progress from the Moses basket. 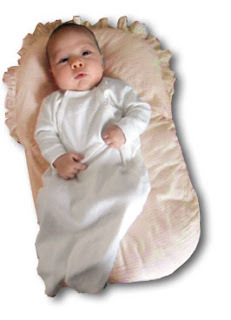 After the first three months in the Moses basket, your infant will move to the thin mattress on the floor. At this point, he or she needs only a topponcino, a light cotton pad (shown above) on top of the sheet. Your infant's room should be kept at a comfortable temperature for his or her small body. Do not use pillows because they are too big and put your child at risk for suffocation. If anyone makes topponcinos, please do post link in a comment here! We are always looking for good ones to recommend. We frequently hear from parents who are trained in Montessori for the Primary class (ages 3-6) that it is impossible to apply Montessori setups and presentations when they work with their own infants and toddlers. All too true! If you do a nice Montessori setup in your home classroom for your infant or young toddler, expect it to be trashed! It's the nature of the child at this age, so we have to adapt. 1. Have one or two low shelves in your child's bedroom. On each shelf, put a few books, one or two large pieces of equipment, and a couple toys. Oh, yes, make sure your child can safely climb on the shelves without them tipping over. 2. If you are setting up a home or school room for toddlers, strip down the shelves! If you set the shelves up in typical Montessori Primary class fashion, the contents will be all over the floor in no time. Has this happened already? No need to reprimand your child at this age, just remove items from the shelves when he or she isn't around. Then re-present some of the items -- you can move the shelves a bit, too, so the room doesn't look oddly bare. 3. Infants and young toddlers are too young to learn to work with the mats. You can have one larger carpet (make it thin, so that towers and blocks do not wobble in the shag) in the middle of the room. 4. Put together one nice box or basket with items to explore. Small interesting items can go inside. Make this the only container with lots of small items for now. When your child gets a bit older and starts putting things away regularly, you can add another special box. 5. Keep blocks in a block area with a large box. The box should be more than large enough to hold all the blocks, so your child does not have to figure out how to fit them inside to put them away. 6. Make sure it is easy to put everything away by grouping items on the shelf. Books go on the bookshelf, toys go on the toy shelf, Imbucare material goes on the Imbucare shelf, and so forth. 7. Keep clear floor space for motion! Your child should be able to crawl around the room, roll, scatter blocks, and whatever else might happen without losing things under sofas and damaging anything.